SALINE, Mich. - Police records show officers tried to contact a teenager who stands accused of killing a Michigan State University student, just three days before the killing took place. The Ann Arbor News reports police had a chance to arrest 18-year-old Tyrel Bredernitz on a bench warrant and a possible violation of a personal protection order in February, three days before 19-year-old Dustyn Frolka was killed in Bath Township. Saline, Mich. police say they went to the teen's apartment and knocked on the door, but Bredernitz didn't answer. They say they notified court officials and the teen's probation officer. Bredernitz faces trial later this month for charges of felony murder, unarmed robbery and conspiracy to commit unarmed robbery. The Associated Press sent a message seeking comment Wednesday to a lawyer for Bredernitz. Bredernitz's co-defendant in Frolka's slaying, 18-year-old Samantha Grigg, was sentenced in May to up to 15 years in prison after pleading guilty to manslaughter and unarmed robbery, reports CBS Detroit. She agreed to testify against Bredernitz and another defendant, 17-year-old Brendan Heim, during their trials. Grigg testified in court that she, Bredernitz and Heim traveled to East Lansing with plans to beat up and rob Frolka, although she didn't say how they knew him. Grigg told the court that she drove Frolka to ATMs before the others started beating him with brass knuckles. "Brendan began to punch him in the backseat of the car and Dustyn opened the door and went out of the car," Grigg testified, adding that the SUV was going between 45 and 60 mph when he jumped. "I stopped on the highway and at that point, Tyrel and Brendan went outside the car -- took his clothing and his money and came back to the car." Frolka was found Feb. 15 partially clothed and clinging to life alongside I-69 in Bath Township. He later died at hospital. 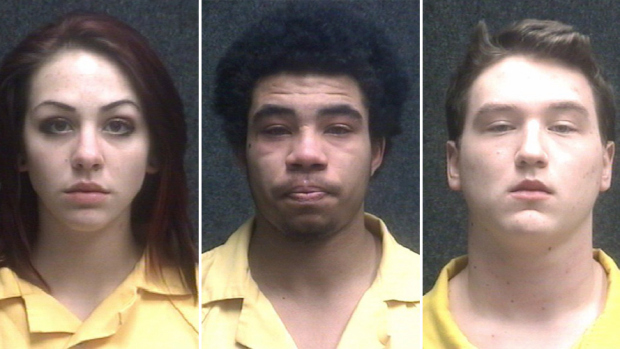 Prosecutors have said illegal drug money was a motive for the robbery. Heim and Bredernitz are scheduled to go on trial Sept. 17.